Violinist Piet Koornhof, one of South Africa’s most acclaimed musicians, has figured prominently in three prior recordings for Delos. In this release – beautifully partnered by distinguished pianist Truida van der Walt – he has assembled a program of mostly 20th-century works that focus more on his instrument’s lyrical, “singing” qualities than its virtuosic possibilities. 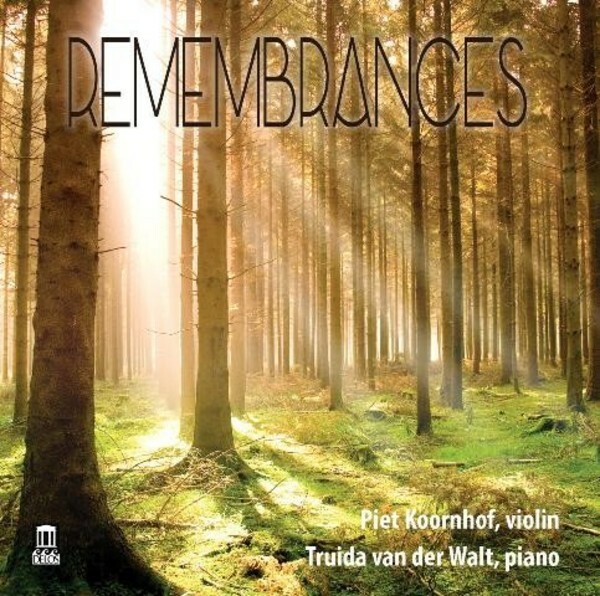 'Remembrances', the album’s title, derives from John Williams’ suite from his Schindler’s List film score. The suite demonstrates the violin’s unique propensity for music that conveys deep sentiment and searing nostalgia. The remaining short selections – from Rachmaninov, Schoenfeld, Bolcom, Scott, Kreisler, Ysaÿe, Tchaikovsky, Prokofiev, Kodály and Piazzolla – all bear potent testimony to the instrument’s supreme ability to express haunting musical beauty and profound emotion. Captured in radiant sound, these sweet and soulfully attuned performances by Koornhof and van der Walt make for an exceptional album that will beguile any fan of music for violin and piano.